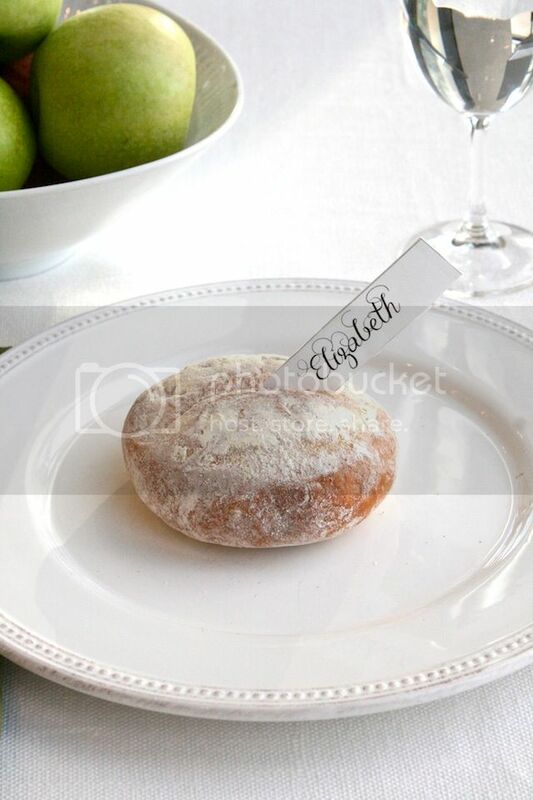 3 Food Place Card Ideas—Modern DIYs For Dressing Up Your Table! / Hey, EEP! 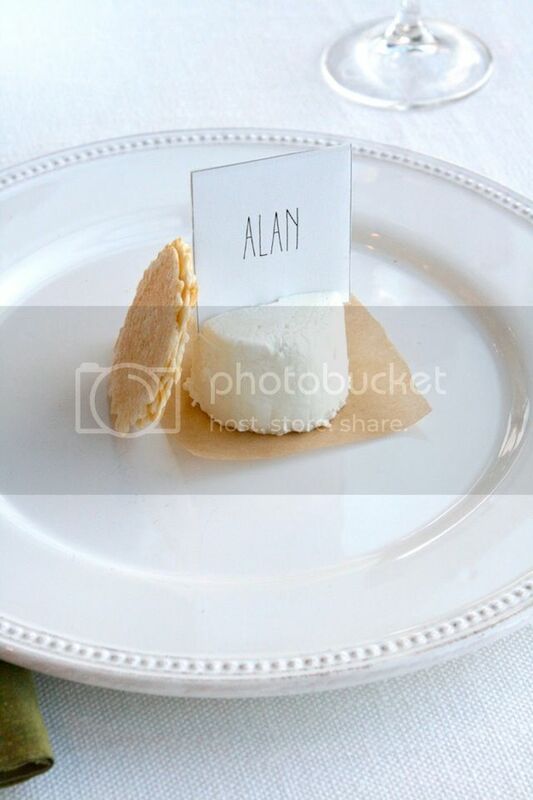 3 Food Place Card Ideas—Modern DIYs For Dressing Up Your Table! Good morning, lovely friends! T-minus 1 week until Thanksgiving. Are you getting excited!? I certainly am. What are you plans? Are you hosting or just eating? Fill me in! Today on the Good Housekeeping blog I posted 7 Easy Food Place Card Ideas to help dress up your table, whether for a big holiday gather (like Thanksgiving) or just a dinner party with friends. I'd love to share my 3 favorites with you, if you're interested! Sugared Cranberries: Pile sparkly sweet-tart candied cranberries (recipe, below) in plastic pedestal cups like these from Party City. 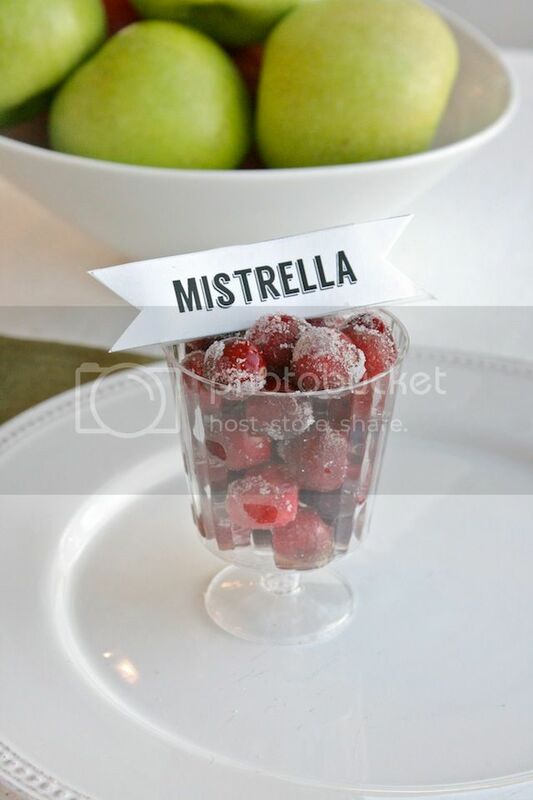 Print names on card stock, cut into tags and snuggle into the cranberries—I used one of my favorite fonts, Canter, to print out Aunt Mistrella's gorgeous name! Cheese and Crackers: Since boyfriend is such a cheese-nut, I tucked his name tag into a little goat cheese "button" (or Crottin) from Coach Farms. Whole Foods usually sells 'em but you can purchase these teeny goat cheese rounds online, too. Depending on the firmness of the cheese, you may need to cut a 1/4-inch-deep slit to insert the name tag. Place on parchment paper squares and add crackers to complete the look! I used the font Aracne Ultra Condensed Light for boyfriend's name. 1. Bring the water and 1/2 sugar to a boil in a saucepan over high heat, stirring, until sugar dissolves. 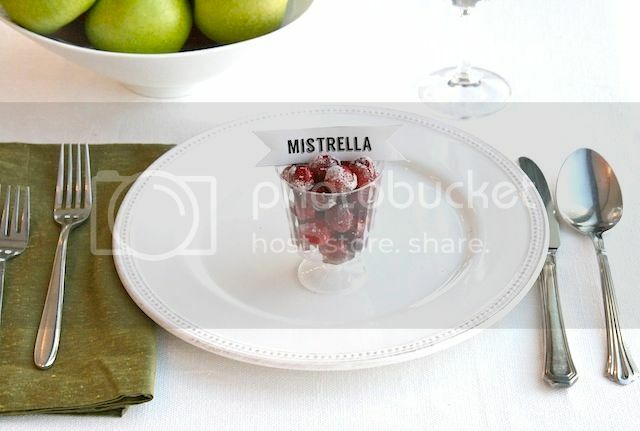 Stir in the cranberries; remove from the heat and let cranberries cool completely in the syrup. 2. Put the remaining 1 cup sugar in a large bowl. Drain the cranberries and toss in the sugar to coat. Transfer to a wire rack and let dry 1 hour. I LOVE these! We do have assigned seats for Thanksgiving but they've been the same for years. Thanks so much @Carlene Thomas RD ! !